Any glitches/feedback comments/improvements for the new forums? Young patient, post-injury. What's the finding? Hi all, This radiologic sign is known as the "Double PCL sign." This is diagnostic of a bucket-handle tear of a meniscus, usually the medial meniscus, which is flipped into a position where it lies anterior to the PCL, and mimicks the appearance of a second PCL. In the above image, there is a curvilinear black structure originating from the distal femur, and then extending posteriorly and inferiorly to insert on the posterior aspect of the proximal tibia. This structure is the PCL. Just anterior to the PCL is a second, flatter, curvilinear structure interposed between the distal femur and proximal tibia. 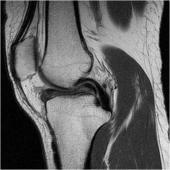 This is the torn meniscus. On this single image, it is impossible to tell which meniscus it is, but usually it is the medial meniscus, and it would be evident when you are shown the remaining MRI images. Here's the Radiopedia article for the "Double PCL sign." http://radiopaedia.org/articles/double-pcl-sign frozenarbitor and TheFancyPanda, The ACL is only seen on a few slices in the sagittal plane, and I haven't shown you any of those images. So unfortunately, on the single image provided, no comment can be made on the ACL. Similarly, the LCL complex is not included in the above image, and also therefore is of unknown status.